The last 2 weeks have been cold & rainy, and I’ve been worried about the new package I installed on April 10th. When I last checked them 2 weeks ago, the weather was good, and they were bringing in lots of nectar and pollen. I was so confident that I stopped feeding them, and that was a mistake. The weather on Wednesday, May 5th was horrible, and I think this was the day that was the worst on my hive. Most of the day had rain mixed with sleet, and the temperature was hovering around 35 F. Thursday was much better and bees from my other hives were out flying again, but I didn’t get home until late evening. Friday I was home and I checked on my top bar hive as soon as the sun was on it, and I immediately put in a jar of syrup–the bees were starving. At least half of the bees had died in the cold. The stores they had brought in were enough to bridge a length of bad weather, but 12 days was too long for them. I did find the queen and she is still alive, but was lethargic like the rest of the hive. By the afternoon, they were scurrying around on the comb, but not flying yet. 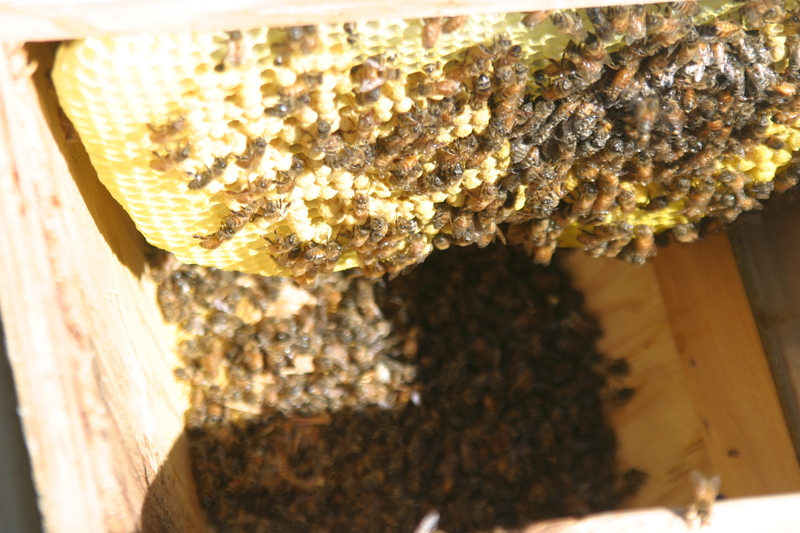 The main alpha hive is doing fine–I left them with enough honey frames to make it through the bad weather. I knocked on the front door of the bravo and charlie nucleus hives, and lots of guard bees came out to greet me. I didn’t open that box because the queens will be mating this week, and I did not want to disturb them. The observation hive also is doing well, except for the top frame behind the glass. That frame gets easily chilled, and does not get the same service from returning foragers as the bottom 5 frames. That top frame also had about a hundred drones emerge last week, and they were stuck behind the queen excluder. Because I need drones this week, I removed the top, and shook them down into the main box so they could get outside. I was not able to find the virgin queen that I had watched emerge, but they often are able to squeeze through an excluder (so I’ve heard). My disappointment has been tempered some by the success of the nucleus hives–they are going better than I expected. Unfortunately the major hit my top bar hive has taken is due to my own mistake of removing the feed too soon from them. This entry was posted in Beekeeping, Top Bar Hives and tagged starving bees, top bar hive. Bookmark the permalink.